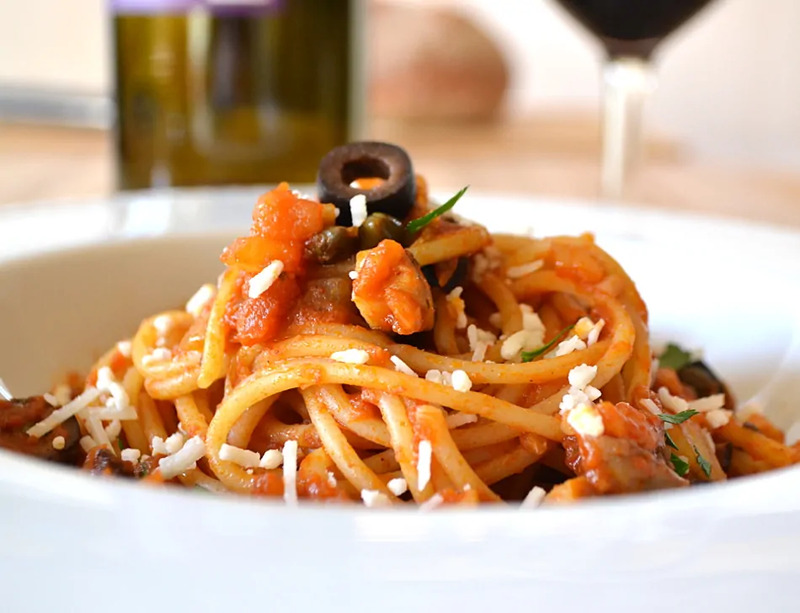 Chunky Puttanesca – a fresh twist on a classic Italian sauce. 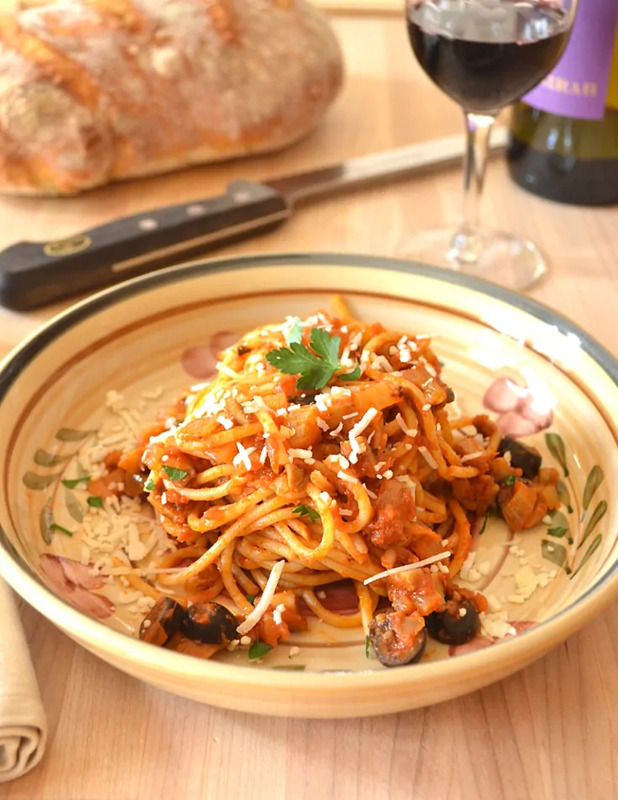 Fennel, garlic, onions, anchovy, olives, capers and mushrooms load this tomato sauce with flavor. Delicious , quick and easy – you’ll have it on the table in half an hour. Not familiar with Puttanesca? You’re in for a real treat! I’ve been meaning to share this recipe for quite some time. 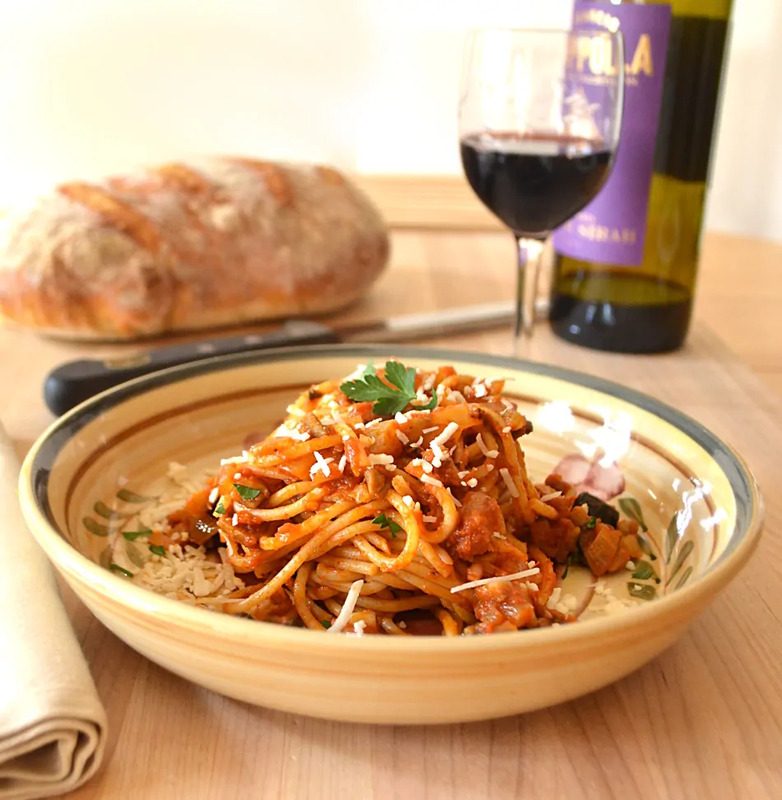 It’s one of my go to pasta dishes when I need a delicious dinner on the table and I’m pressed for time. This sauce has an unbelievable amount of flavor. There is so much bold and bright flavor – layer after layer of it – in each bite. There is so much going on, yet it all blends beautifully. The origins of this dish are interesting. It is said that puttanesca was the sauce of the puttana, or a “lady of the night”. There are different stories on why it was this “working woman’s” sauce of choice. Some say the enticing smell of the simmering sauce would lure potential customers in. Others say the ladies were so busy and needed a quick and delicious sauce ready to go to keep themselves and waiting customers fed. I’m betting it was a combination of all those reasons. So I call this Chunky Puttanesca. Hehehe. Besides trying to be cute & clever, there is a reason. It’s Spring and it’s time to brighten everything up a bit. 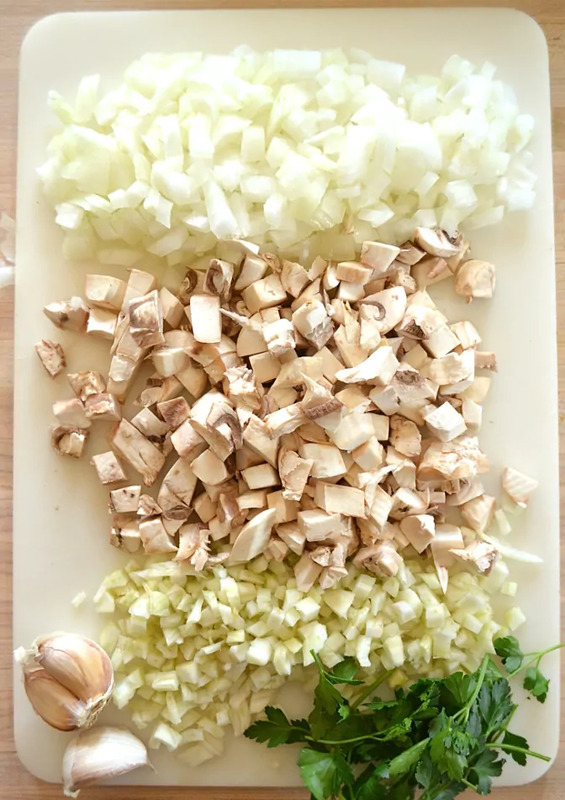 This classic dish is absolutely perfect itself – but it’s a whole new level of deliciousness with some onions, fennel and mushrooms thrown in the mix. Good thing no “John’s” were wandering about the country roads today in my neck of the woods – they would have smelled this sauce simmering from miles away! Lol – I make myself laugh. As for the anchovies. Like em’, love em’, can’t stand em’ – it doesn’t matter so much here. There is no distinct taste of anchovy in this sauce. 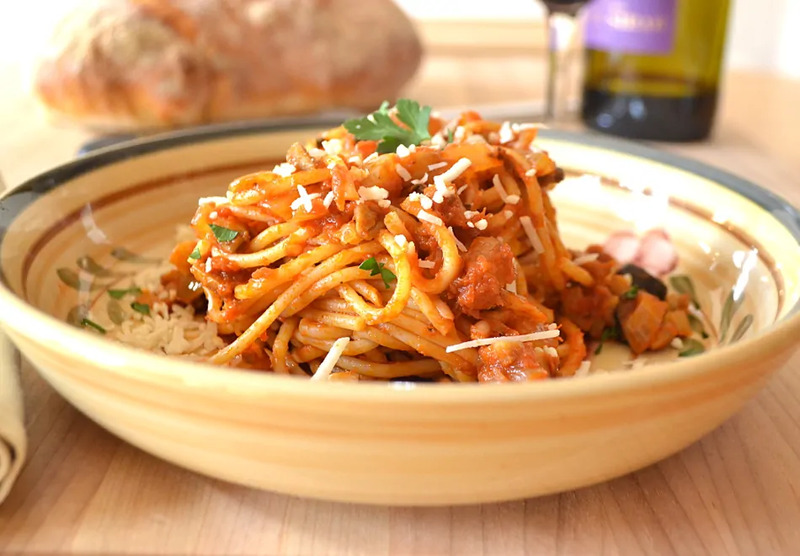 The anchovy blends to create another magical dimension of this surprisingly simple sauce. True story. I remember as a kid going out to a restaurant and ordering spaghetti with red sauce. I asked the waitress if there was any fish in the sauce. She said she didn’t know and looked at me like I was absolutely insane. I replied that I would have the spaghetti if there was no fish in the sauce. LOL. Why would a kid ask such a thing? In America, you don’t find sauces laden with anchovy or sardines that often. You sure do when you’re abroad. Anyhow, I’m guessing we just got home from visiting family in Europe and somewhere I had stumbled upon some super fishy sauce. Rest assured, this isn’t one of them. I appreciate the days where I have time to make a sauce from scratch. Nothing beats starting a sauce with fresh, local tomatoes and homegrown herbs. The aroma of it simmering low and slow for hours is heavenly. (Someone should make a scented candle of that!) Everyday is not so perfectly simple, though. I still get the homemade flavor I want and speed things up using a jarred sauce loaded with authentic Tuscan flavor. 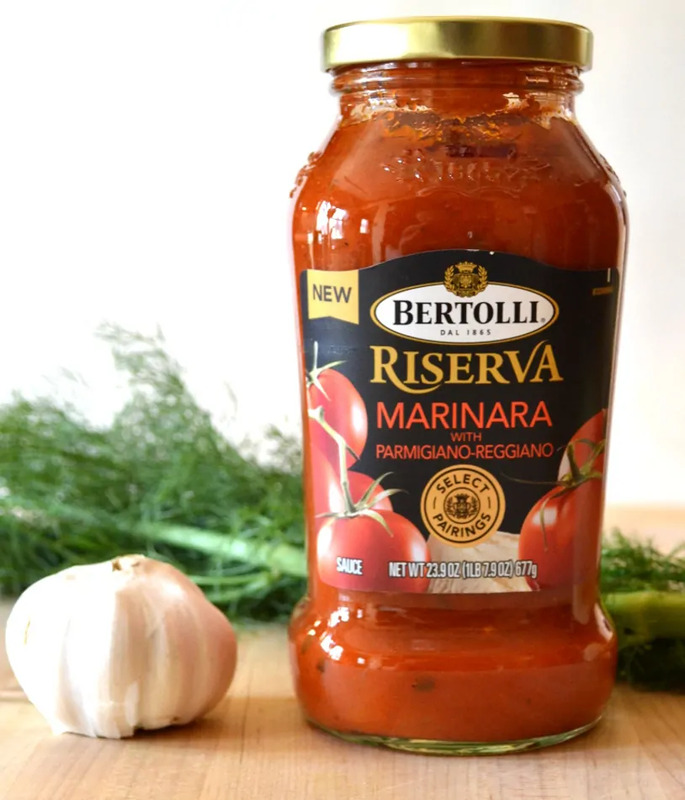 I’m in absolute love with Bertolli Riserva Marinara sauce – I literally could have eaten it with a spoon straight from the jar. Although I dressed this sauce up – it would be absolutely wonderful served “just as” with pasta and some freshly grated Parmesan-Reggiano. Suddenly hungry for Italian? Of course you are. 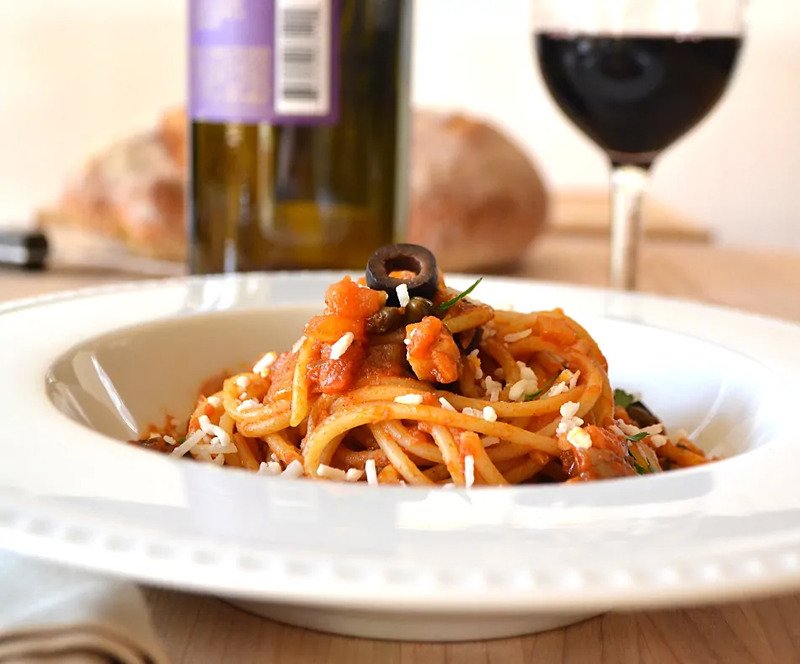 Need more Italian recipes? Yes, yes, yes! Visit Bertolli for TONS more recipe inspiration. A fresh twist on a classic Italian sauce. Fennel, garlic, onions and mushrooms load this Puttanesca with flavor. Quick, easy and delicious. Add onion and fennel saute until translucent and tender - about 10 minutes. Add mushrooms, saute for a few minutes. Add sauce, red pepper, olives, capers, oregano, black pepper and anchovies. Bring to bubbly boil, reduce heat to low and cook covered for about 15 minutes. Add cooked spaghetti & a bit (approx 1/4 cup) of pasta water to sauce and toss. Salt to taste. Sprinkle with fresh parsley and loads of freshly grated cheese. Enjoy! Mmmmm, love the name ‘PUTTANESCA’. Indeed this is a treat. 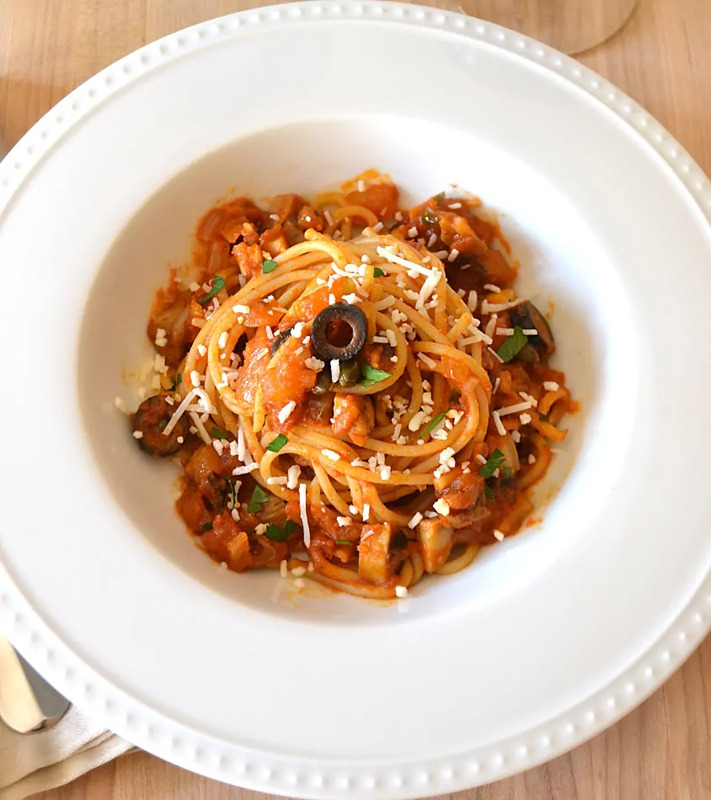 Love colorful, delicious and full of flavors this spaghetti looks. Can’t wait ti give it a go. What a great recipe! Those photos make me want a bowl full right now! This is a delicious, satisfying bowl of pasta, Amanda! I’m all for the anchovies in the sauce. It adds wonderful flavor to the sauce. I can seriously have the puttanesca morning, noon, and night! Oh yum this looks and sounds wonderful! Thank you for sharing this dear. Can’t wait to try this out. Looks super delicious and lovely color! I think that I could eat this every night of the week. It looks delicious. This looks delicious, Amanda! And I agree – someone should make a scented candle of that scent! That would be amazing, wouldn’t it? That was pretty funny when you were a kid and asked if there was any fish in the sauce. I can only imagine the waitresses face, lol. 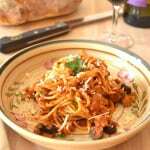 I never thought I would like anchovies, but now love them in recipes. They just kind of dissolve and add so much flavour! Thanks so much, Rani! I hope you enjoy it! And Athena is in my class. By the way this looks so good i’m going to ask my mom to make it.